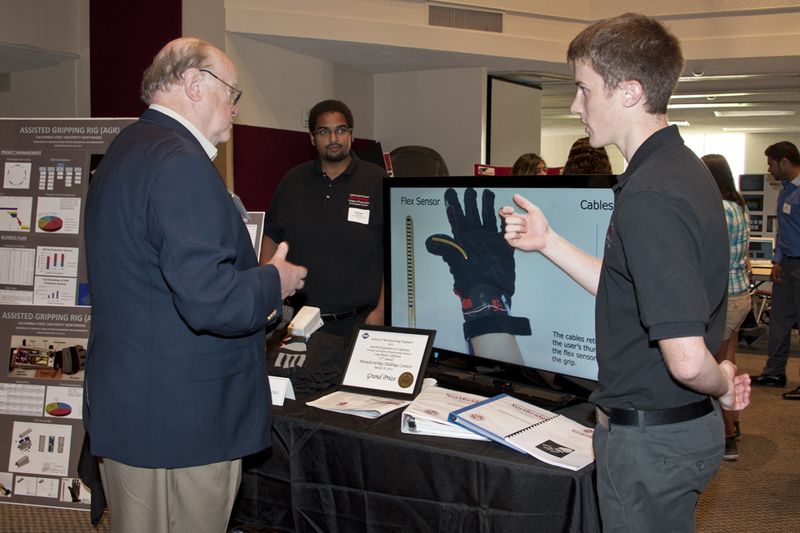 Members of the first place-winning team explain their Assisted Gripping Rig at a recent university showcase. Photo by Lee Choo. Manufacturing systems engineering students at California State University Northridge took top prizes at the Manufacturing Challenge sponsored by the Society of Manufacturing Engineers (SME) at the Aerodef Manufacturing Conference and Exhibition in Long Beach this spring. One CSUN team was awarded the grand prize for creating a device, known as or ARG. The prize is given to the “best of the best” out of all the teams who compete in the Manufacturing Challenge. The Assisted Griping Rig is a glove that includes sensors that can detect when a hand initiates a grip. It can augment the hand grip of the elderly and people affected by stroke, brain damage or carpal tunnel syndrome. The students used the university’s computer numerical control (CNC) milling machine and 3D rapid prototyping printer to create parts for the rig. Another CSUN team took the first place prize in the university division for creating a device, known as the Automated Automotive Lift System or ALS. ALS can lift a car up to three feet but can be reduced to less than six inches, so that it can be used on high and very low cars. Team members said the product appeals out to both automotive hobbyists and small automotive repair shops. Extensive pattern searches were made. Most of the parts were cut by the students on the university’s CNC machine. In addition, senior James Hunter, a member of the automated Automotive Lift System team, received the William B. Johnson Leadership in Manufacturing award. “In 26 years of SME west regional competition, it was the first time that one university has swept all top prizes at the Manufacturing Challenge,” said professor Mark Rajai, instructor of the manufacturing systems engineering senior design course. Ileana Costea, chair of the Department of Manufacturing Systems Engineering and Management in CSUN’s College of Engineering and Computer Science, said this year’s wins has particular significance. “In the past, our students have received numerous awards at the Manufacturing Challenge,” she said. “In the past, our students won the first prize, the second prize. One year our two teams won both the first and the second prize. A student won the Manufacturing Leadership Award. However, this year’s success is important, since it is the first time a CSUN team has won the grand prize. The Manufacturing Challenge is a competition in which students at four-year schools and community colleges demonstrate their expertise and knowledge in creating innovative products. The members of the AGR team included Khaled Altukey, Tawsive Ibrahim, Colin Irwin, Jobinderjit Kaur, Hovig Keushkerian, and Aaron Michelson. The Automated Automotive Lift System team included Arin Clint, Ivan Escobar, James Hunter Kevin Manocheri, Jordan Stawarz, and Aydzhan Salim (Jon Simms). For more information about CSUN’s Department of Manufacturing Systems Engineering and Management, visit their website at http://www.ecs.csun.edu/msem.